I could go back and forth on the answer to the question ‘If you were stranded on a dessert island, what one food would you chose to eat every day?’. My answer is pretty much even, and that would probably be pizza or tacos. I am torn on both because both the taco, the shell for that matter, and pizza, the dough, for that matter, are great vehicles for endless possibilities and creations. Pizza is one of those things that I could probably eat every day. I love pizza. I mean, come on, the mozzarella cheese, and spicy pepperoni, or heck even a simple mushroom pizza, and I’m golden. It was not long ago when I had pizza on my mind, but I did not have any homemade dough on hand, nor did I have the time to make any, nor did I have any frozen slices. I did however, have all of the ingredients, and some homemade bread on hand, to make what I am calling the pizza style grilled cheese sandwich. 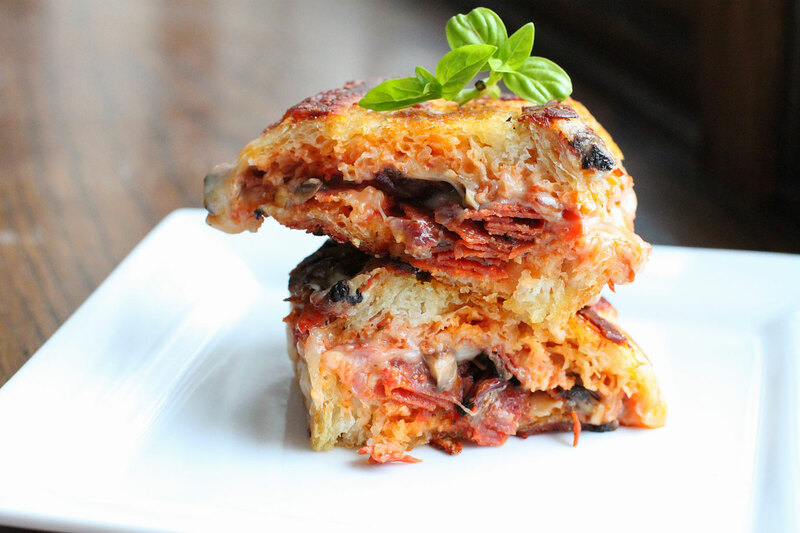 This pizza style grilled cheese sandwich has every everything you love in a pizza, but all tucked away and nestled into a sandwich. What doesn’t get better than that, right? The great thing about this style of grilled cheese sandwich, is that you can put whatever you want into it, much like you would if creating your own pizza. 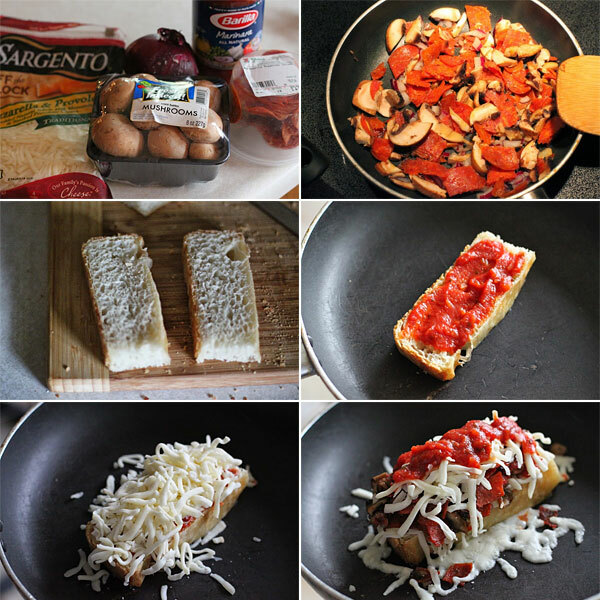 Start by adding the mushrooms, pepperoni, and onion to a small, non-stick skillet and bring to a medium heat. Cook for about 8 minutes or so to render some of the fat from the pepperoni. Add the mixture to a paper towel lined plate, then place the mixture into a small bowl. Wipe out the skillet, and return to the stove. Butter each slice of the bread as you normally would when making a grilled cheese. Add one slice, butter side down into the skillet, and bring to a medium-low heat. Spread half of the warmed marinara sauce onto the bread, then top with the pepperoni mixture, then top with the mozzarella cheese. Drizzle the remaining sauce on top of the cheese, then add the remaining slice of bread, butter side up. Cook slowly, allowing for the cheese to fully melt, then flip, and continue cooking until you have a nice and crispy exterior, with a hot and cheesy interior. This pizza style grilled cheese was hard to put down. It’s everything you want in a slice of pizza, as well as a grilled cheese. As soon as I finished it, I began thinking of what style of grilled cheese to make next. This one was a real winner. What are your thoughts? 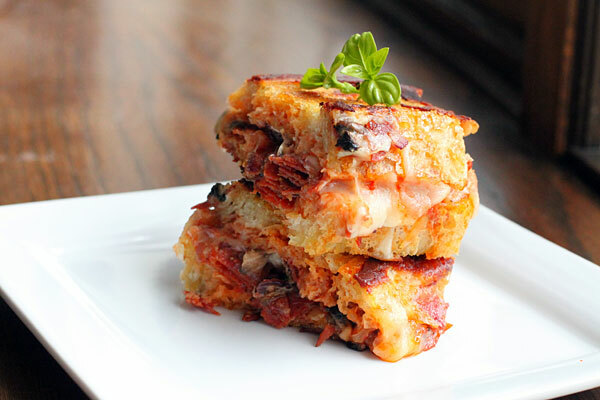 Pizza style grilled cheese right up your alley?